The rains have arrived. So hence our frying pans are out and the fragrance of fresh bhajyas is wafting through our houses. We all have eaten all the yummy fritters that go with our hot masala chai. 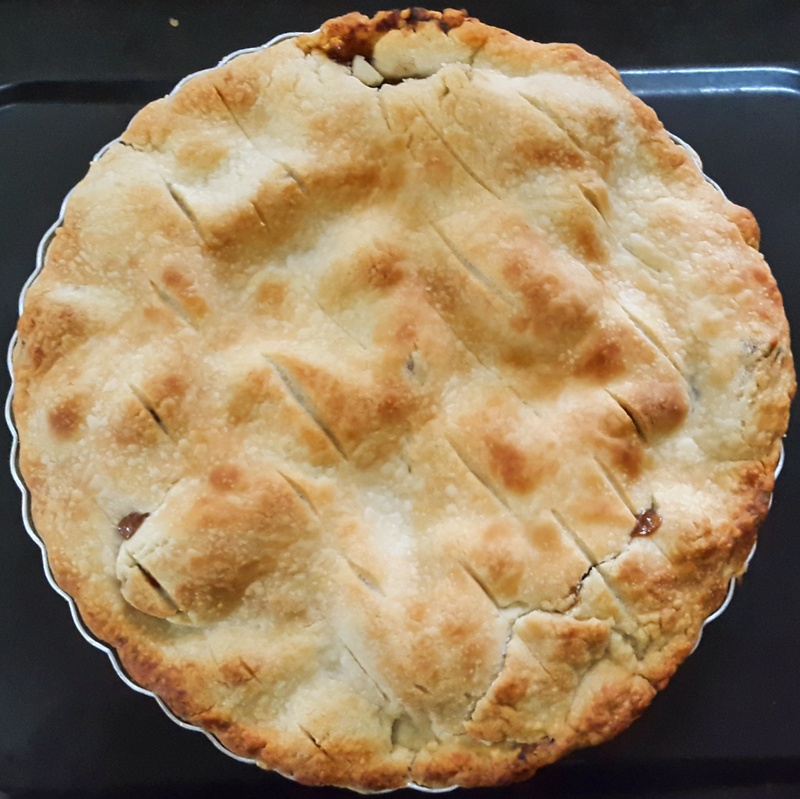 How about we do something different and go with a warm goey delicious slice of an Apple Pie. I love hot desserts in this weather. Just imagine yourself with a cup of hot tea and a slice of an apple pie, sitting by your window, watching the beautiful rain pouring down. So romantic! Want that moment – go make this pie now! Mix flour and salt in a large bowl. Add pieces of cold butter. Rub the butter and flour with your hands or pastry cutter. Do not over mix, as we do not want to melt the butter. Add one tablespoon of water at a time and mix till the dough forms a ball. Wrap and refrigerate for 40 minutes. Grease a 8 inch pie pan. Remove the pastry dough from the fridge. Divide it in half. Roll the dough in a 9 inch circle. Place it on the pie pan and lightly press on the edges. In a large bowl, mix sugar, cinnamon, nutmeg and flour. Add the apples and coat it with the mixture. Transfer the apple mixture in to the pie pan. Take smaller chunks of the butter and lay it randomly on top. Roll the remaining half of the dough and cover the pie. Press the edges. Score the top lightly. Bake on 200 C for 15 minutes. Then 190 C for 40 minutes or till the top is golden brown and the apples are soft inside. If top tends to burn, cover with foil. Let the pie cool down for at least 1 hour before serving.